For all my angst with the Linchpin, Seth Godin makes a very valid point about ‘shipping.’ For those, like me before a few months ago, unfamiliar with ‘shipping:’ it is doing whatever it is we’re typically afraid to do, for whatever reason – fear, failure, fear of failure, etc. This week I shipped. I shipped three different products. For the first time, I participated in a summer SC2 event, not just as an attendee, but as a presenter. And, for the first time, I wasn’t scared. I don’t mean I wasn’t nervous. Nor was this my first time presenting, I’ve done presentations before (one day conferences: SC2 and virtually with Teachmeet Nashville). This time was different, though. The difference is I didn’t let doubt consume and influence every decision I made about my presentations. I did not stress about each being perfect (they so are not) or needing to be perfect. I wrote down some notes to remind myself of what I had learned using the tools, resources that helped me along the way (primarily people), and shared my mistakes. Each evening, I made mental and timing adjustments to the next day’s presentation based on the previous day’s feedback. More importantly I had fun sharing ideas and techniques I know are valuable, even when my own use is flawed and not where I want it to be, and requiring myself to use a new ‘tool’ for each presentation. This was the first session — just web-based tools and iPad apps to be used to share class notes and/or create short how-to videos. I used Prezi and kept the info brief. As with the rest of the sessions, my goal was to have the attendees spend time doing. I focused time on three of the tools: showme, screencastomatic, and screenr; and had each make a video with two of the three. 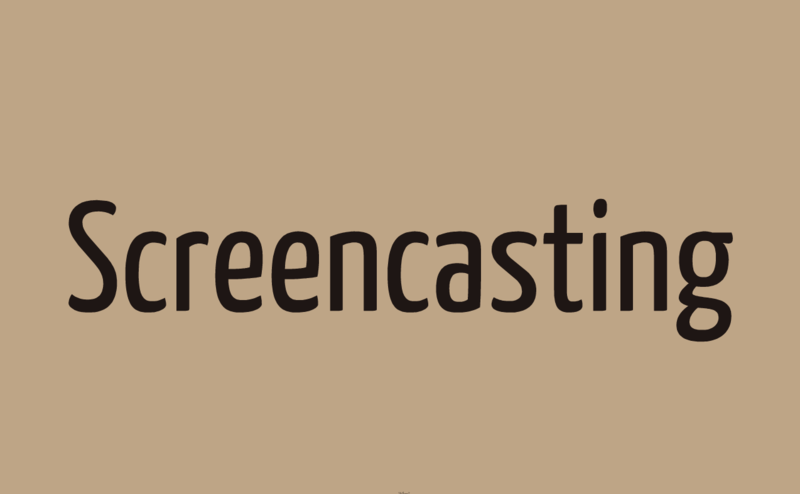 The discussion after was where I shared links to other people and sites and resources I thought might be beneficial to a first-time screencaster. Not the best presentation out there, but, I was okay with it as a start. As an aside, this session was up against the keynote speaker at the event, Brandon Lutz (60in60), and I was thrilled a few people showed (though I think it’s because his session was full). Next time, I’d like to include more discussion about how and when to use this tool; the backwards planning behind implementation. It would also be nice, from a purely selfish perspective, to review something like Ramsey Mussallam’s “Explore, Flip, Apply” approach with others and get their take/ideas. Not to mention, rolling out these new videos to students — website? Dropbox? URL via text, email, etc? This needs to be known before beginning. For two reasons, I used Haiku Deck in this session. First, this was not my first presentation on this topic. I gave a presentation over this a little over a year ago at a one-day SC2 event. The focus that time was on the why you should do it and there was no time to get the teachers tweeting and blogging. I didn’t want to get sucked into that again. Haiku Deck forced me to be to the point, get to the essential ideas. Secondly, the aesthetics — choosing a picture to reinforce the words (or vice versa) added to the overall impact. I did put a few public notes to several of the slides, but did not spend time on those, except in passing, as we moved to setting up twitter accounts, discussing hashtags, and talking through work-arounds due to district limitations. To effectively utilize the power of twitter in class, requires routine. Again, this is one of the shortfalls I find in my own use. 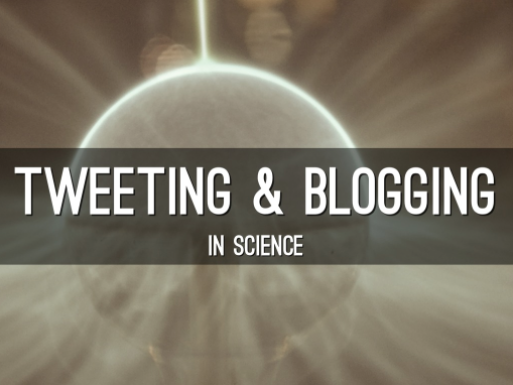 As I mentioned (both in the session and here), I use it as a back channel for guest speakers and for movies/videos in class; I also threw a plug in for #scistuchat (the archives of topics was a selling point here) and a quick look at hootsuite and tweetdeck. We did not get to blogging, except to briefly visit blogger, wordpress & kidblog. And, we took a brief amount of time to see Pearltrees (especially with Google Reader going away) for compiling student blog links; the alternate possibility is having them on a website so everyone can access each other’s. The obvious negative for Pearltrees, it’s not an RSS compiler/feed/aggregator thing (my ignorance here is apparent). This also meant we did not have the opportunity to work through the purpose of maintaining the blog. I was able to share some rubrics for tweeting and blogging as well as the contracts I use in my classes, so, parents and students are clear on the expectations associated with these tools. Next time, these will have to be split into separate sessions. This would allow more time for depth as opposed to the cursory mention of hashtags and back channels. Plus, let people converse about the possibilities they see with Twitter in class. There are a couple of changes in my own use I’m contemplating. Currently, I have students create a new Twitter handle, a ‘professional’ existence online. Yet, since it’s not them exactly, they will lack the benefits of developing a professional digital footprint. The other revolves around my sporadic use, it’s not routine. I’m thinking of coupling it with my bell ringers or as a component of an exit ticket of sorts. As for blogging, actually have time for each teacher to decide what their purpose would be in their classroom, what outcome do they want to see? Should they be an evolving document? An e-portfolio (like Chris Ludwig uses)? Is this best demonstrated through assigned writing? According to Will Richardson, assignments aren’t real blogging, but if a student demonstrates a synthesis of information, an analysis of thought, isn’t that blogging, regardless of the prompt? What about commenting? Community? Audience? These questions could lead to better rubrics, regional partnerships between classes a la quadblogging, and effective use of this tool in each class. Okay, so not an expert or even a novice on this. I actually put this down because I wanted to learn to use it. What better impetus than stepping up in front of strangers and colleagues with a tool you know nothing about to force the issue? This time I used Springpad. I wanted something more structured/scaffolded for the presentation, a guided walk. Loved this! It worked exactly as I’d hoped. In fact, one of the attendees wanted to use it as his organizer for his class units – links, videos, note sheets, etc. Plus, I have to admit, Springpad seems to do everything everyone talks about Evernote doing and it’s a lot less intimidating. As can be seen in the notebook, I showed a before/after video of Beau Lotto’s TED Talk; let them see a finished interactive video; get an idea of what could be done. My goal was to have them leave with two products: a 6 word memoir & an interactive video to be used in class. A bit audacious for the time, however, if all that had gotten finished was the 6 word memoir, I believed each person would be far more likely to do the second one on their own; success breeds success; playing leads to less fear of failure. After this intro, I directed the participants to find a YouTube video they could modify. I had figured most folks would kinda know of a video they used and would tend towards the known, but I included a couple of channels just in case (see the list). This, actually, was a much slower process than I anticipated. The flaw here was placing it in the beginning; this should definitely have been a last step; the step after producing the 6 word memoir. The second hiccup was the google forms Screenr video I included and had them watch. Shouldn’t have done that; should’ve simply referenced it: here’s a quick rundown for creating a google form and you can review it later as needed. 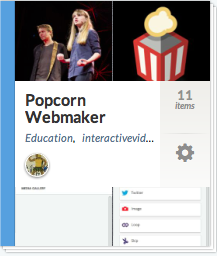 While it was only 5 minutes, it was 5 minutes not spent manipulating Popcorn Webmaker. I also needed to push it and the Polleverwhere info to the end to separate the tools for the two product goals I had in mind. This would have provided more time doing, more time making, which was the whole point of the presentation; and was also the most common theme of the feedback I received. Overall, most seemed to take to the possibilities and some needed more guidance, needed to be nudged to mess up and try again. Hopefully, many will play on their own during the summer and/or will introduce it as a project to their students. One of the possibilities for me is to use this to create a narrated claymation video of a playdoh brain. My anatomy class alredy builds the brain, but adding the claymation, narration and interactive video, the project becomes so much more (and I stole that idea from the gal I worked with in the claymation session). In essence, going in the midst of colleagues, risking rejection, and finding others willing to go down a similar path of discovery was worth it. The best part, overhearing conversations here and there where people were discussing the tools and the possibilities in their classrooms; that people did find something useful. It also was nice to know I wasn’t being completely self-delusional, that helps, too. BTW, thanks for your comment on my blog! I think I fixed the link; thanks for letting me know. I enjoy reading about physics and modeling, though, I do neither. Appreciate the sharing.